Hello everyone, I'm the sound producer, sound director, sound creator... basically the guy who does everything related to sound... Koori Yousuke. Uhh, yeah, who the heck are you? There's probably a lot of you out there thinking the same thing like with Shimojima from the last time. 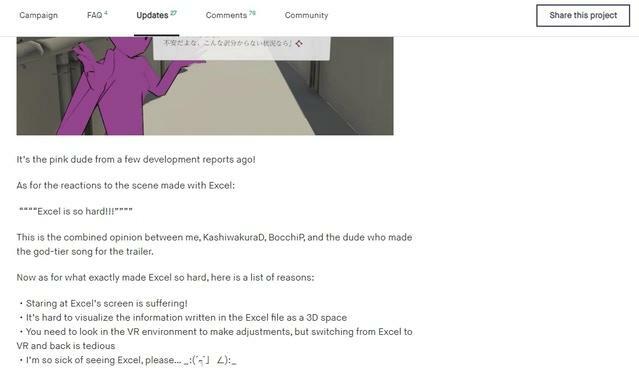 I totally lost all impact compared to the " " " "Excel is so hard!!!" " " " part though. Putting aside whether it's a "god-tier song" or not, I think it'll be easier to get an idea of who I am if you can just see me as the guy who made the song for the first trailer. For those who haven't seen it yet, please check it out! That long introduction now over, for this second installment of the technical development reports, I'd like to introduce the particulars of the stereophonic recordings of the character voices. "With VR, the visuals are everywhere around you, but it's also important to have the sound coming from all around you too." The VR experience isn't just reliant on visuals, but the sound aspect is also a crucial element in improving the overall experience. To improve the feeling of characters actually being there, as well as the overall world feel, then there is a need to compensate what the game can lack in visuals with sound. In particular, for characters that need to exude the feeling of "being there", we want to make their voices more clearly heard. Okay, let's up the quality and bring in stereophonic recordings! And that's the story of how we started looking into it all. With the introduction of stereophonic sound, we first had to make sure it could fit into our development environment. Just as written in the first tech blog entry, TOKYO CHRONOS is developed using software called Unity. That said, we needed to make sure that we could both run Unity, and figure out how to integrate stereophonic sound into the development. Are you familiar with binaural microphones? 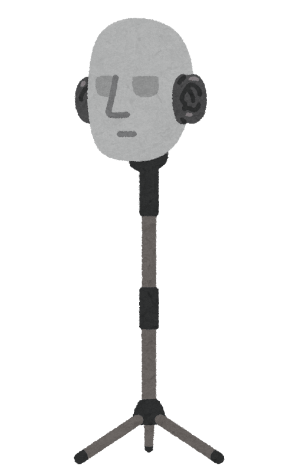 They're also referred to as "dummy head mics" - basically there are microphones in the two ears. Because they're meant to simulate how sound travels to the ear as closely as possible, recording on one of these can actually make it sound fairly close to the real thing. Wouldn't we be able to record some pretty high quality stereophonic-type sound on one of these?! Or so we thought, but it's not as easy as it sounds. The microphone definitely does make for some excellent binaural recordings. However, using it for VR purposes is pretty difficult. Let's say a character is right in front of you, and they shout "I love you!!" while blushing. ● Binaural Mic→ Even though the other person is to your left, you can still hear "I love you!!" coming from in front of you. Because feeling the existence of the other characters is so important in VR, that sense is greatly strengthened if you can hear their voices from exactly where they are. We needed the sound to be able to change on the fly, especially for users who tend to move their heads around, so binaural mics were out of the question. With the above as a given, we came to the conclusion that we had to do the stereophonic sounds within Unity, allowing the sound to change based on where characters were in real time. ● You can tune the location of the sound→ You can even set them on a per-character basis! Woohoo! ● Adding spatial reverb effects is nice and smooth→ The reverb sounds nice and natural! Yay! In particular, being able to set the locations for each and every character is huge. Each and every person's voice has a unique quality to it. Some have voices that are nice and clear, others are hard to hear. With stereophonic sound some voices might be easy to hear, but others might be hard. "I can hear this character's voice well, but that one, I can't hear their voice so much..."
We'd like to avoid the above from happening, so there's a need to fine-tune every single character's voice so they can be heard clearly. In other words, it's "a white lie to make everyone's voices clear"
After deciding to use DearVR in Tokyo Chronos, we once again asked Mr. Omurice (Shimojima) to set up something in Unity so we can adjust each character's voices within a VR space. Here is a very sad, sad setting where neither Nikaido nor Momono want to even talk with me. We check back and forth with the visuals to confirm the sounds of multiple characters onscreen, making adjustments as needed. There is one character voice that cannot be replicated in stereophonic sound via Unity: the voice coming from the player's own viewpoint. <1>Whenever I talk, I can hear it in my ears, but it also reverberates inside my head! It's a fairly easy to use plugin, and you can buy it straight off the net, so I think just about anyone can!! However, there are other plugins that simulate stereophonic sound. It just so happens that DearVR is what I found easy to use, so please do try the other plugins as well, you might find them all interesting! We actually have something to announce very soon! I'm looking forward to all your reactions!